Located across from Walnutport on the west side of the Lehigh River, Slatington became the center of the region’s Slate industry. In its heyday, slate was used for everything from durable roofing shingles to chalk boards in schools. The Lehigh Slate Company’s quarries, in and around Slatington, were among the largest in the U.S. They furnished some of the country’s highest quality slate. But a large portion of Slatington’s growth and success is also directly tied to the opening of the Lehigh Canal and the resulting ease of shipping. The town further blossomed when the railroad was built in the late 19th century. Today’s traditional downtown, with large Victorian homes, is a reminder of the commerce generated by the canal, railroad and slate industry. Look carefully and you’ll notice elaborate slate roofs that display the beauty of this local building material. It was once shipped as far away as British Columbia to adorn the provincial capital building in the Canadian province. 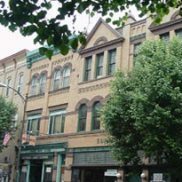 Slatington’s streetscape artifacts are closely tied to the story of extraction, processing, transporting and marketing of slate.